It was Sunday afternoon. Several family members were eating together in a restaurant, and little two and a half year old Jace had his little toy cows with him at the table. Jace loves his cows. They go with him everywhere he goes, including to bed with him at night and all around the house. 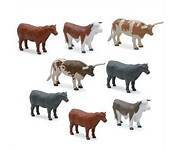 The three little cows are made of a breakable plastic, which has rendered one of the cows with only one original leg. Two of the other legs consist of a screw twisted into the remaining part of the leg and body and wrapped with black electrical tape to match the one good remaining black leg. The fourth leg is just missing, which in Jace’s eyes makes no difference, even though the cow cannot stand up. His Father will fix that fourth leg, but Jace loves his cows no matter how banged up, impaired, and non-functional they might be. If you have Jace with you, you have his three cows with you. The Bible says when we were without strength Christ died for the ungodly, and that God “commendeth his love toward us, that while we were yet sinners, Christ died for us” (Romans 5:6-8). In other words, even though we are like Jace’s broken cows and cannot stand on our own feet God’s love toward us is not diminished one minute. He still wants us to be with him at all times and be healed and restored in every way. In order for us to be with him, he sent his Son into this world to be our Savior. Jesus conquered all the temptations of the flesh and devil so he never sinned and was totally pure and righteous for us. He was beaten at the hands of the authorities which secured healing for everyone who believes (Isaiah 53:5). He died for us as the totally acceptable sacrifice in the eyes of God. His blood sacrifice was full payment for the sins of all mankind, for whosoever believes and receives him into their life as their one Lord and Savior (John 3:16). He was raised by the power of God’s Spirit, victorious over sin, satan, death, and the grave. He is seated at the Father’s right hand of all power and authority, and those who believe, are positioned with him in that spiritual realm. Through the power of that same Spirit that raised Christ from the dead, by our receiving and walking in that Spirit, God has provided for us to be with him at all times to walk and talk with him and live in his renewing power on earth today. He has promised to keep us and take care of us if we believe and walk in his Lordship. This is the Good News of Jesus. How Jace loves his three cows is how God loves us and keeps us with him at all times as we give ourselves to him.